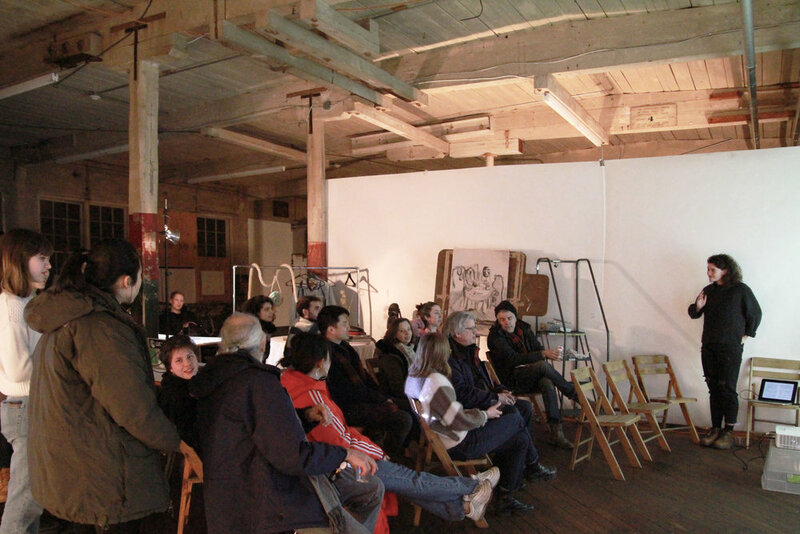 On Mar 16th, Rúni Weihe presented his artist residence show, Moving on: on my ongoing writings; poetry, notes and travelogue. The show was of a discussion of three different manuscripts that Rúni is currently working on. The manuscripts in their different form and shape can initiate a discussion about the text as sound, as noise, as an image. The manuscripts presented were; A collection of poetic tableaus written from a month-long hike between abandoned quarries on the Faroe Islands in the summer of 2017; An ongoing collection of notes, brochures, items and travelogue; Text “as found”: A year of post-its written by a mother who deals with depression and anxiety transformed into sound/noise and as physical cut-ups. Rúni Weihe was born in 1985 on the Faroe Islands. He graduated from the Aarhus School of Architecture in 2012. During his master's degree he had exchange studies at Hogeschool vor Wetenschap en Kunst - Sint Lucas in Brussels, interned for New York based work ac, and had an extended semestre at the Aarhus University studying epistemology and the history of ideas. Upon graduating he worked for a few years at smaller offices first in Aalesund, Norway and then later in Copenhagen, Denmark, before turning his attention towards teaching and writing. In 2016 he got accepted to the two-year programme at the school for creative writing Forfatterskolen in Copenhagen where he graduated in the summer of 2018. 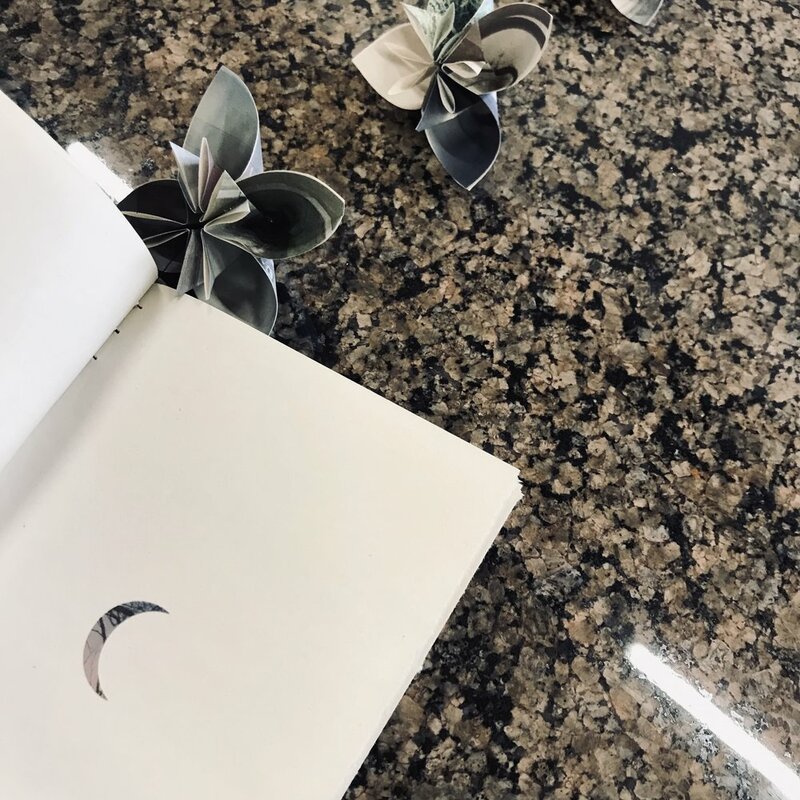 Rúni writes poetry, prose, and essayistic travelogue, and holds an interest in space, place, history, privacy, movement, monotony, rhythm and melancholy amongst other things. 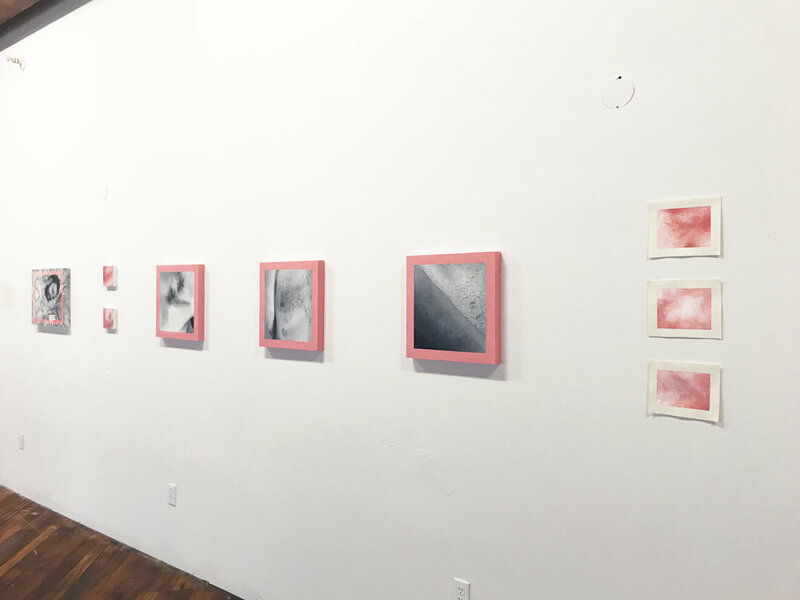 On Mar 15th, Emily Stroud presented her artist residence show, Reclaiming Pink. The following description is provided by the artist. When observing bodies our judgement of them is often clouded by societal norms ingrained within us as to how we believe certain people should appear. In my work, I portray figures that have a varying idea of their own gender and specifically their femininity. I depict my subjects fully submerged in their own domestic environment, unconcerned with the societal pressures surrounding them. With oil paint, I create softness with the figures and the space they occupy. This creates a duality between the fragility and certainty within my work. During my childhood in the south, I was forced into confusing and conflicting ideas of femininity. These ideologies of how women should look never felt like they fit my personality and often caused me physical and emotional distress. I rebelled against these norms, which also felt isolating and uncomfortable. In young adulthood, I am starting the process of unlearning what I've been told and coming to terms with what mixture of feminine and masculine traits make me and others feel safe in their bodies. I have begun to use pink in an attempt to reclaim it, forming a loving relationship with the feminine parts of my personality and body. Emily Stroud is currently working out of Birmingham, Alabama. She has received her Bachelor of Fine Arts degree from the University of Alabama at Birmingham with a concentration in oil painting. 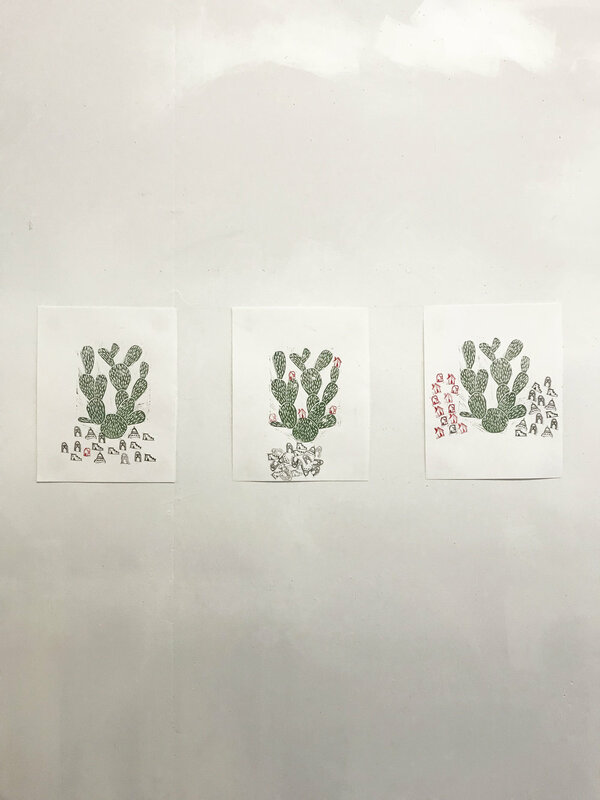 Her work has been exhibited in southeast region galleries such as The Birmingham Museum of Art, Abroms-Engel Institute for Visual Arts, and The Wiregrass Museum of Art. Her work focuses on the attitudes surrounding gender and sexuality that still exist in the south. 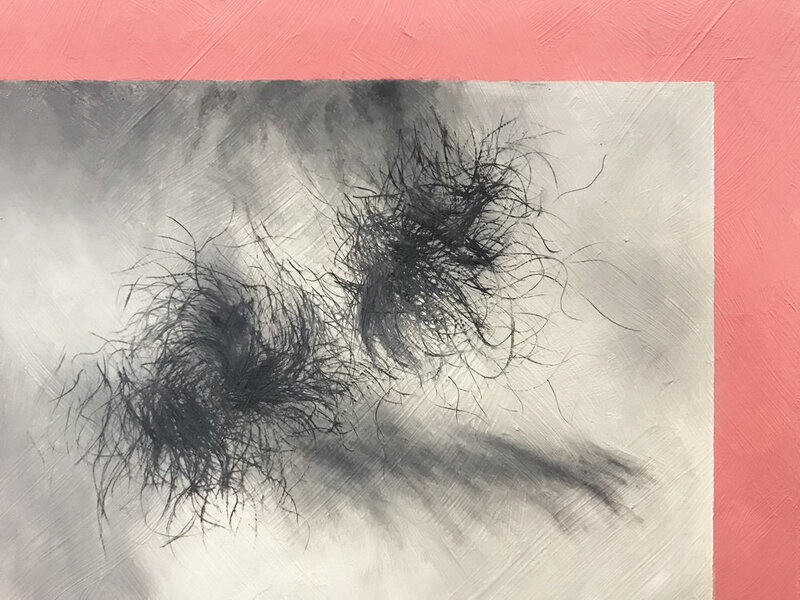 By painting soft realistic figures that do not fit into societal norms, she makes the viewer think about the ways gender and sexuality inevitably vary. Her work challenges gender norms and stems from her own experiences growing up as a woman from Alabama. 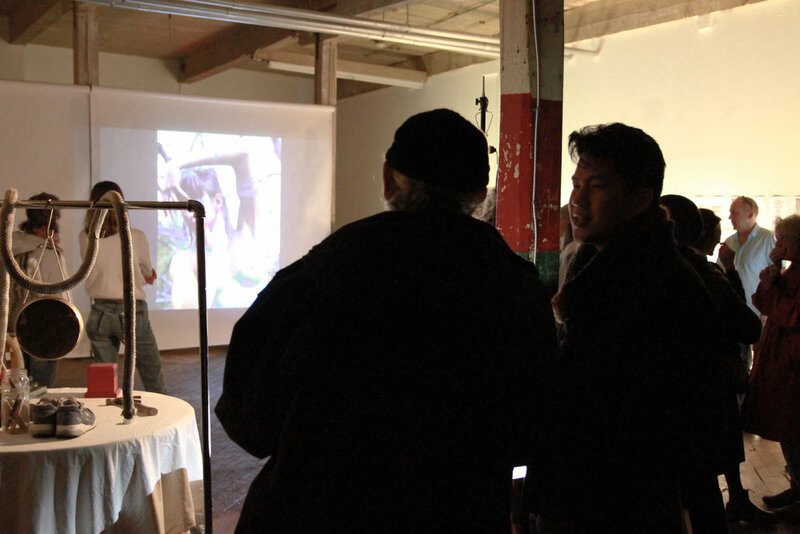 On Feb 24th, Efrat Arielle Peleg presented her artist residence show, Between Jerusalem and Tokyo. 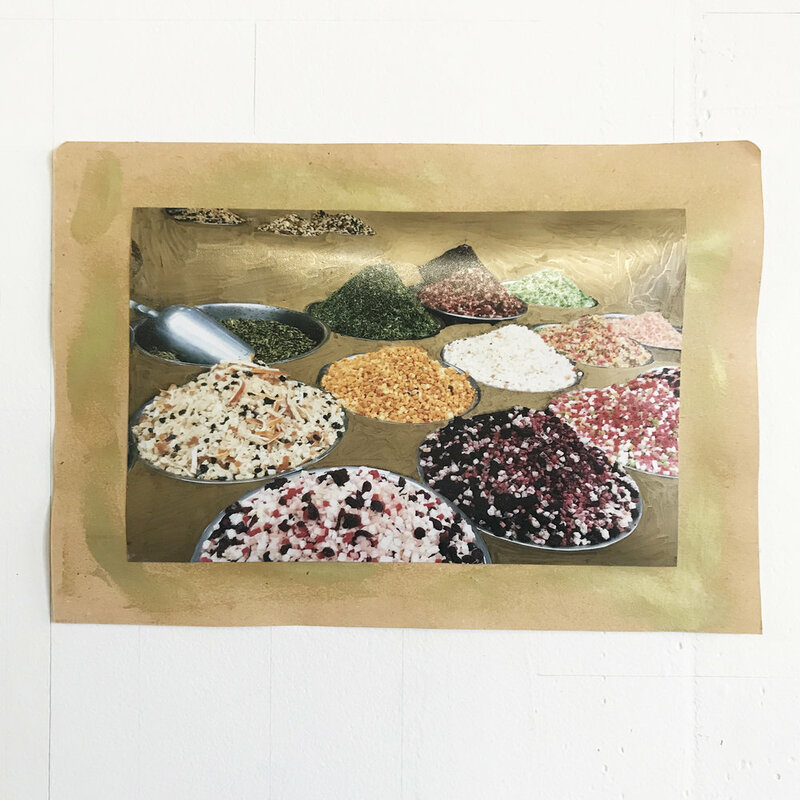 During her eight weeks at Arts Letters &Numbers, Efrat Arielle Peleg took the time to process her three years living and working in the city of Jerusalem. 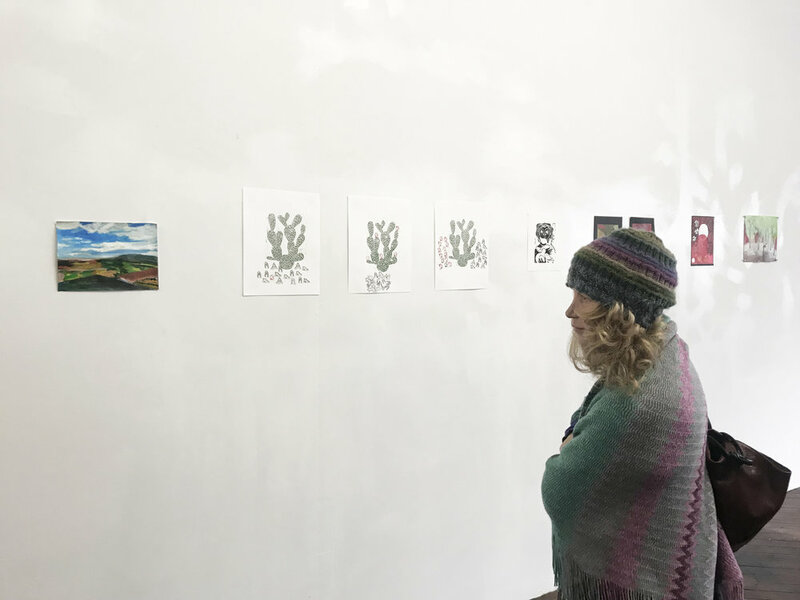 The Sharing presents a variety of experimental pieces, mainly paintings and prints that express her reflection upon the reality in Israel and Palestine and her love for the Holy Land as a nostalgic place. Another theme, which appears in some of the works, tells the story of a remote winter in Averill Park, New York. Efrat Arielle Peleg is an Israeli artist who moved to the US as a young adult. She graduated from Bard College, NY, in 2015, with a dual degree in Fine Art and Asian Studies. Efrat studied abroad at Kyoto-Seika University, Japan, where she discovered how deeply connected she was to her own Israeli culture and the conflict embodied in it. This understanding urged her to return to Israel to work with human rights and peacebuilding organizations such as Solidarity of Nations and Seeds of Peace. 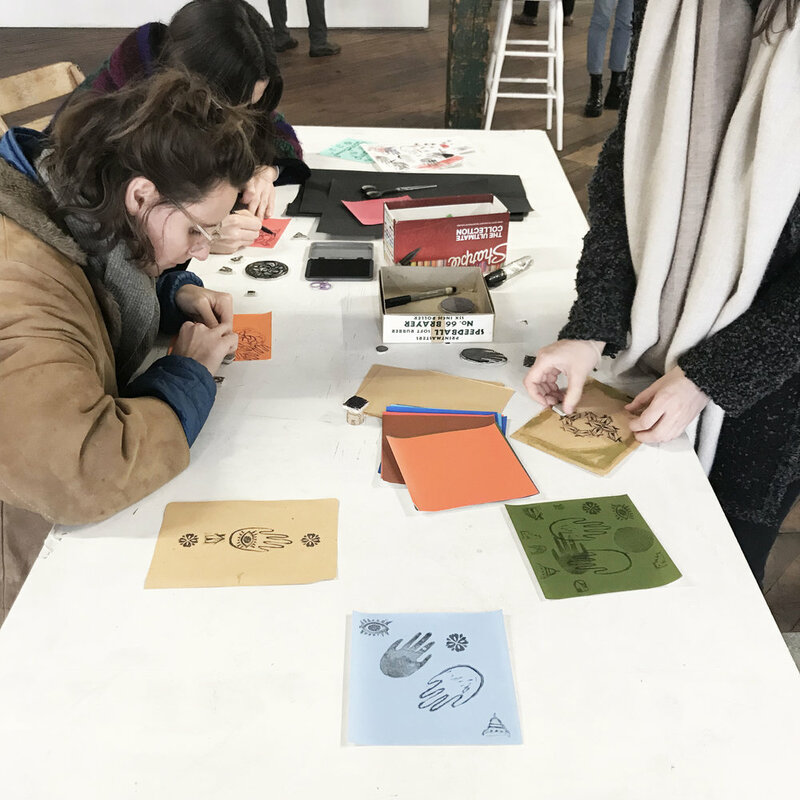 Working in Jerusalem for the past three years, Efrat has combined art with education in a way that has allowed her to build meaningful relationships with both youth and adults, Palestinians and Israelis, in a variety of frameworks. Art helped her foster these relationships and go beyond spoken language. 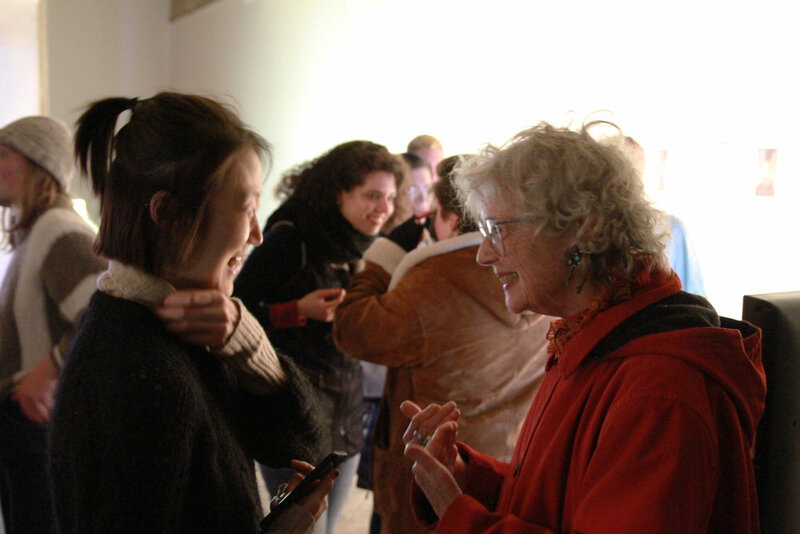 Therefore, Efrat sees art as a universal language, a powerful tool to communicate and share the stories that all people, anywhere, carry within. While in Jerusalem, Efrat pursued working on her personal artwork is local studios. She expresses her own stories and learnings through paintings, printmaking and imaginative illustrations. People always want to leave some traces for the world, afraid that they have only been there, and have no impact on the world. And my experience tells me that traveling uninterruptedly without leaving any trace is a higher realm. If you leave no trace of yourself, it does not mean that others will surely forget you. 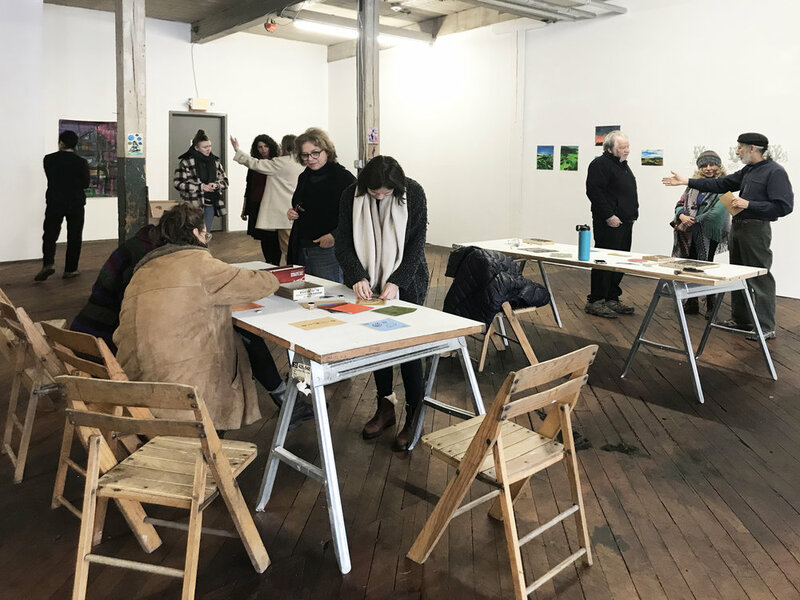 On a cold Sunday afternoon the ALN studio was transformed into a sanctuary of remembrance bringing warmth and comfort to those who came to the book and film release event offered by Ira and Nadine Baumgarten. KOI Collective was formed in August 2018 by three liked-minded composers from Oberlin Conservatory – Soomin Kim, Kari Watson and Natsumi Osborn – and works to promote and celebrate women, trans and non-binary composers through collaborative projects and community outreach. Artists visit Arts Letters & Numbers for various reasons and one of them would be its own placeness. Distant from repetitive and regulated city life, Averill Park is a place of discovery, founding and observation. Surrounded by nature of woods, lake and hill, artists often encounter the unexpected, recognize fresh and get inspired from them. 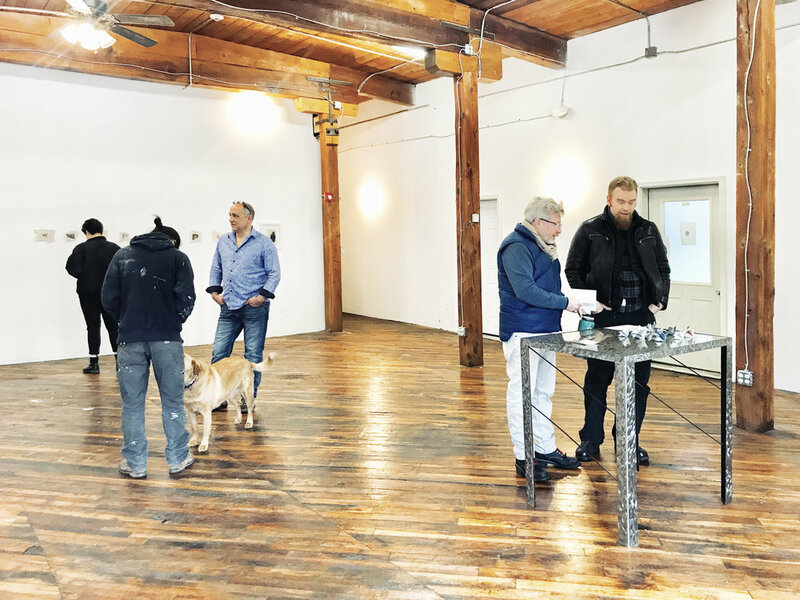 As leaves changed in colors covering the grounds, Wolfgang and Steven shared their site-specific artworks on October the 6th 2018. Extended from their professional fields, Wolfgang and Steven introduced and improvised what they have discovered around the site fused with their own views and interpretations. 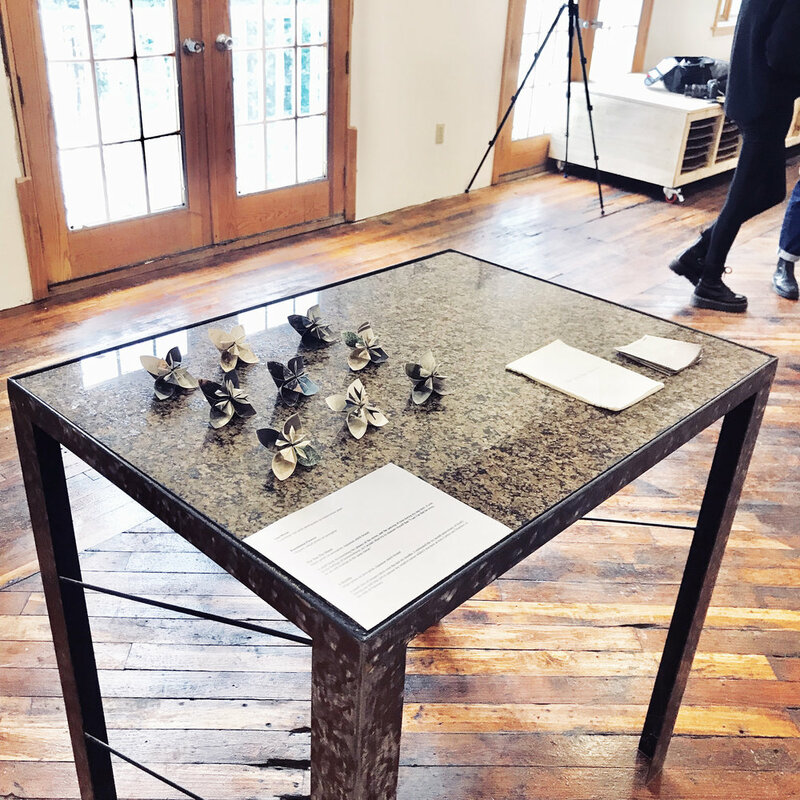 Wolfgang Kahler apprenticed in Architecture, with a BA in design and sustainability from The Evergreen State College, Wolfgang Kahler is a designer and craftsperson with a love of experimentation. He is excited by unconventional materials and practices, by the combination of old and new, by acts of service, by collaboration, and by all opportunities for learning and play. Steven Bellosguardo fuses contemporary techniques with a traditional approach to sculpture’s original subject, the human figure. Utilizing mediums associated with modernist sculpture, figures are rendered from flat sketches on steel, cut out and assembled, creating an interplay between two- and three-dimensional elements. 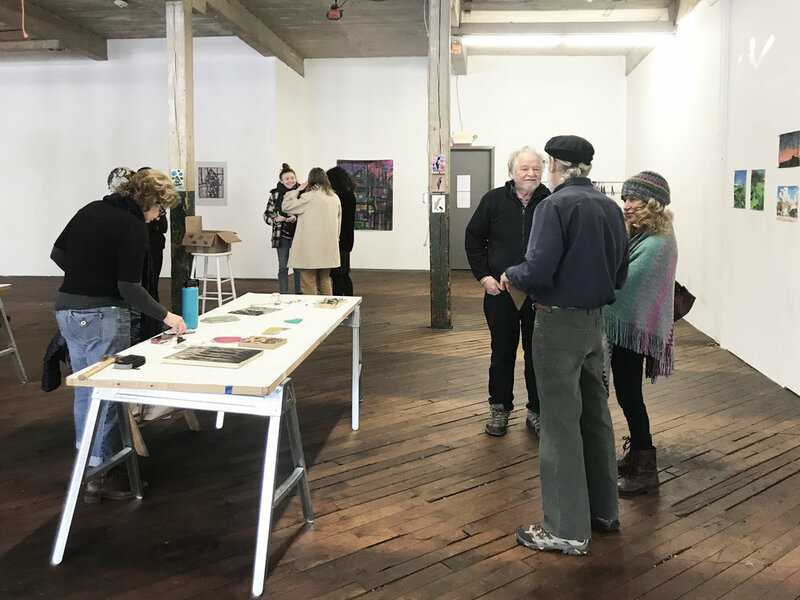 Various encounters between national and international artists who are currently on residency at Arts Letters and Numbers have been mixing mediums and creating works which question the environment and population of Averill Park and its surrounding region. 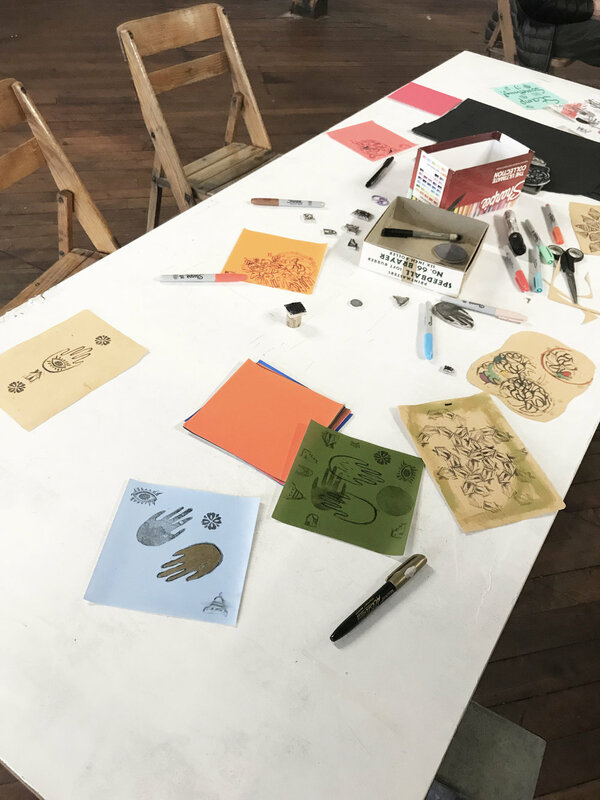 On September 2nd Arts Letters and Numbers invited the community for some light refreshments whist we celebrating the works which had been produced over the past 2 and a half weeks by the current artist in residence. Matthew Bacher, San Diego, CA. What can our relationships with nature tell us about ourselves? 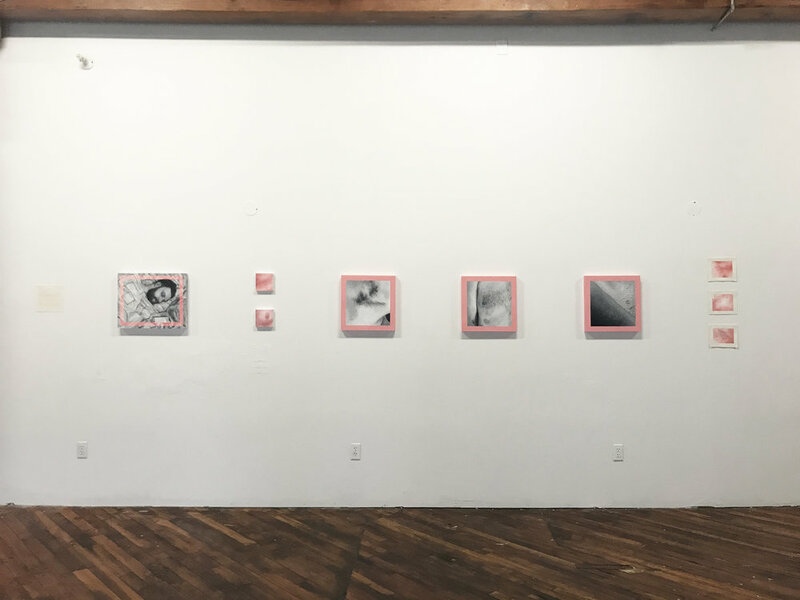 Artist Matthew Bacher asks these questions as he examines the connections and disconnections that we share with the natural world. "Sometimes its good to remember that we're still animals." Tilly Davey's work questions the vulnerability of humanity and the daily struggles which the world at large faces and has done so since time memorable.Directing and tutoring a number of different community art programs throughout Canberra,Australia has a large impact on the works that Tilly produces. Christopher Raia is a multidisciplinary artist and illustrator based in New Jersey. In 2018, he received his BA in Interactive Multimedia at the College of New Jersey. 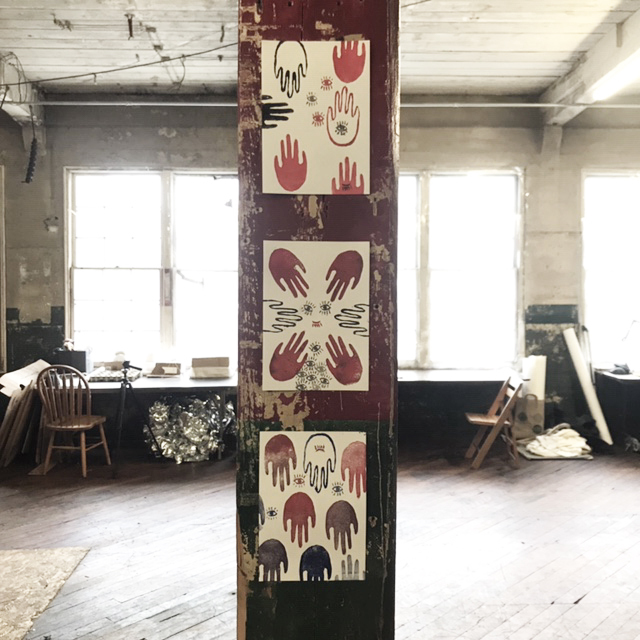 His practice mixes both physical and digital means of making in order to create installations that transform spaces and provoke conversation. 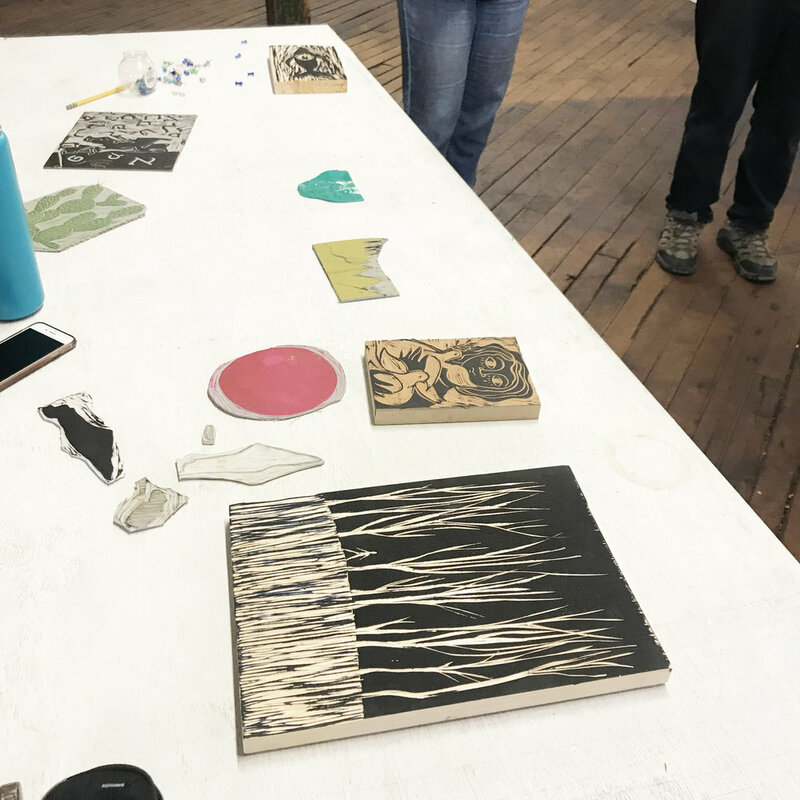 In the blossoming summer days our amazing group of artists in residence Augustine Cordero, Betsey Gravatt, Jenny Zander, Dan Thorpe & Michelle Wan Lok Chan, invited the community to share their work. 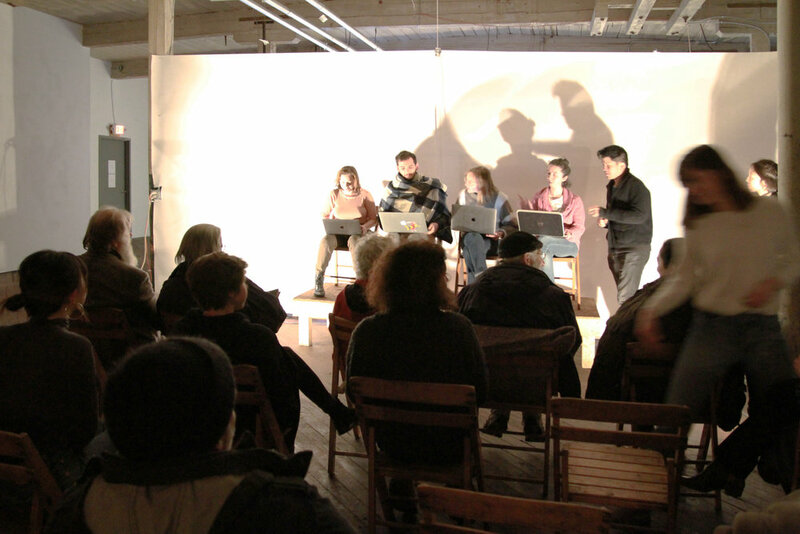 Whether they had been at Arts Letters & Numbers for months, or for just a few days, the urgency of sharing work with the community was very present. Working closely next to each other sometimes results in beautifully unexpected collaborations - some of these were shared through performances and visual arts during the evening of May 25th, 2018. "My work references late 80s/early 90s nostalgia. Specifically, themes from popular culture. Questioing masculinity and personal security from a mixed boy's prespective of this time. My process is primarily intuitive. Working from memory only to arrive at a point that I feel is balanced." 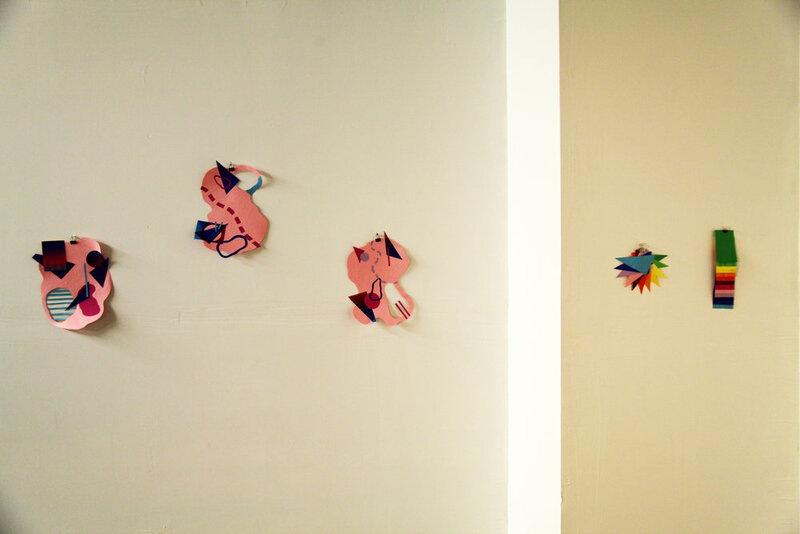 "I use an alphabet of bright colors and shapes to create objects that are reminiscent of 90's toys and cartoons. I arrange my pieces and their components until I have created a piece that reminds me of happy memories from my childhood."